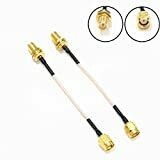 · Connectors: All-copper RP-SMA Female to RP-SMA Male cable，which is more convenient to connect wire jumper. · Characteristics: High temperature and acid corrosion resistent, high-frequency low-loss antenna extension cord. · Capatibility: Very handy for positioning the antenna，Didnt lose any signal strength at all，works great and super light,Suitable for various angle. · Perfect for extending your fpv antenna. Easily bendable and has great mounting capabilities. High-frequency low-loss antenna extension cord.